Dungeons and Dragons is a classic when it comes to tabletop RPG. It's great to see that this book has done such a good job at examining the evolution of the game with a good use of visuals. Old players can relive the nostalgia and new players can learn about the history. 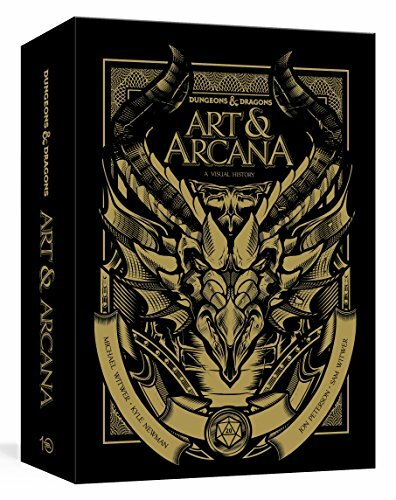 Publisher Ten Speed Press has published two editions of Dungeons and Dragons Art and Arcana. One's the standard edition while the other's a special collectors edition. Both are huge hardcovers with 448 pages. The special edition (the one I'm reviewing) comes with a clamshell case that houses the hardcover, 10 prints and a small booklet with original game design and initial art. The special edition definitely looks exquisite. I'm not sure if the hardcover, as in the cover, is any different. The texture on this special edition has a soft matte feel to it. I'm not a Dungeons and Dragons person so I'm not the most appropriate person to review this book. All I can say is this book is packed with in-depth and lengthy writeup that accompanied by photographs and 700 pieces of artworks. There are packaging art, toy design, anime stills, pencil sketches, illustrations, maps, comics and more. It covers D&D 5th edition. Regardless of which edition you get, if you're a D&D fan, I'm very sure you will be thrilled as you go through the book. This book is a wonderful tribute to D&D.